# Note: Lower scale factor scales-down the image more and detects smaller objects. # Higher threshold results in a higher detection rate, with more false positives. But my script just does nothing. It gets the snapshots, but recognized nothing. Does anyone have any experience in including own haar-cascades? Did I implement it right? I've altered Ibrahim to this issue. Not sure how to start the debugging process for this as I don't know this part of the code. Can you print the Haar Cascade object to see if it was loaded without issues? Hi, I'm not sure why it's not working, try to remove the stages argument to test all stages. If you can you attach the xml and binary cascades I'll test them for you. I attached the XML, but I can't attach the .cascade-file due to the filetype..? Note it has 16 stages (the script prints cascade info) you should use them all. Also used a 0.85 threshold and 1.15-1.25 scaling factor. Sorry for asking again, but can someone tell me wheather this .cascade-file is working? # HQVGA and GRAYSCALE are the best for face tracking. greenLed = pyb.LED(2) # define green LED. # By default this will use all stages, lower satges is faster but less accurate. # Note: Actual FPS is higher, streaming the FB makes it slower. Hi, I've asked Ibrahim for help. No this one doesn't work, when I run the script my cam hangs, if you can attach the xml file for this cascade I'll regenerate it and test again. I created the XML-file with openCV. In order to run it on my Laptop (using it's webcam) I created the new version of the XML-file (without the parameter -SaveBaseFormat). 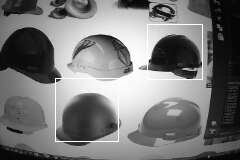 The result is very good an it detects a lot of hardhats. Is this a common issue=? Have you tired playing with the threshold and scale ratio? I tried to replace the eye detection cascade with a new one. I converted the .xml file to .cascade file using the provided tool. But the video stream stuck and I think the camera cracked . I read the thread above and bascially the problem is the same as Fabianhummel's. You created a new binary cascade (cascade.zip) for him and it also works on my machine. I want to know how you did that. I also attached my xml file. It'll be great help if you create a binary cascade for me. Hi, it seems the cascade tool only works on Linux. Also Note it doesn't work on Windows. Please post the steps of what exactly you did. Can you run it from the terminal so we can see the error ? here I converted the file for you. Is there any tutorial to learn this topic like this?? No the script should work out of the box though, anyway we're going to add a built-in cascade converter to the IDE it's just a matter of time. How to write the xml file to the script or in the other words how to Introduce xml file to script? Hi, you pass the xml file after the script name. I put the xml name in the script or in the terminal ? It is possible to place the modified file? i got an error. So here i attach the xml file.Seem i stuck to convert to cascade file.After that,does the cascade embedded directly to camera or i need to transfer the cascade into internal memory to load on another script. The converter doesn't work on Windows, try the attached cascade. You need to copy the cascade to flash or sd card, see examples and replies to this post. lens_mm = 2.8 # Standard Lens. sensor_h_mm = 2.952 # For OV7725 sensor - see datasheet. I'm not sure, maybe try a lower scaling factor (1.15). it's done.thanks..Now i'm designing alignment algorithm for AGV.Openmv camera as input,then arduino as controller also encoder for each mecanum wheels as feedback for positioning agv.Btw can i make that openmv determine the spool position either left or right side plus with distance from camera(already done) to tell AGV position(Camera) against spool(target) ? @aqeelyaacob Please post a new topic for that with as much details as possible. Hi, support for the new Haar cascade format is somewhat limited, we only support 1 feature and 2 alpha per weak classifier. This cascade has 2 features and 3 alpha per weak classifier so it's not going to work. See the haarcascade_frontalcatface.xml for an example of a supported new format cascade, or use the old format. Does the cascade converter work on macos?I couldnt find the eye cascade binary in the Github directory, so had to generate it but it doesnt detect. I used the frontalface cascade binary provided and it works. Hi, I'll put some effort into updating the docs for all that in the future. Um, but, yest, it works on Mac if you have all the required libs. Thanks for the reply. If the binary generated from the provided eye cascade xml doesn't detect the eye, what could be the problem? i pass roi from the frontalface detect. I have attached my files. Could you please share me a working eye cascade binary, i am confused? Does the cascade converter work on macos? Haven't tested it before on Mac.
. Also, you can re-generate any cascade from xml using the script. If the binary generated from the provided eye cascade xml doesn't detect the eye, what could be the problem? i pass roi from the frontalface detect. I have attached my files. Could you please share me a working eye cascade binary, i am confused? Could you try the example first using the built-in cascades, and see if it works ? face_eye_detection.py looks fine but it doesnt work with the eye cascade generated by me. I have attached the cascade in my previous post, could you please regenerate and try? Thanks for the support. Much appreciated! The script should generate an identical cascade. Note I never tested the converted on Mac (and it doesn't work on Windows) I can only confirm it works on Linux, you could try to run the script on Linux VM and compare the output. I tried to use your cascade_convert.py to convert haarcascade_frontalcatface.xml but always failed. and I don't know why. could you help me convert it?